A subscription that includes Azure Information Protection Plan 1 or Plan 2. If you don't have a subscription that includes this plan, you can create a free account for your organization. Rather than relying on users to manually label their documents and emails, you can use some of the policy settings to ensure a base level of classification. Using the Azure portal, we'll edit the global policy to change policy settings for all users. Change your settings to match the value in the following table. Make a note of the settings that you change in case you want to change them back again when you have finished this tutorial. Select the default label General If you don't have a label named General, select another label from the dropdown list. Unlabeled documents and emails will have this label applied automatically as a base classification. However, users can change your selected label to a different one. All documents and emails must have a label On This setting is often referred to as mandatory labeling because it prevents users from saving documents or sending emails that are unlabeled. Together with the default label, documents and emails will have either the default label that you set, or a label that they choose. 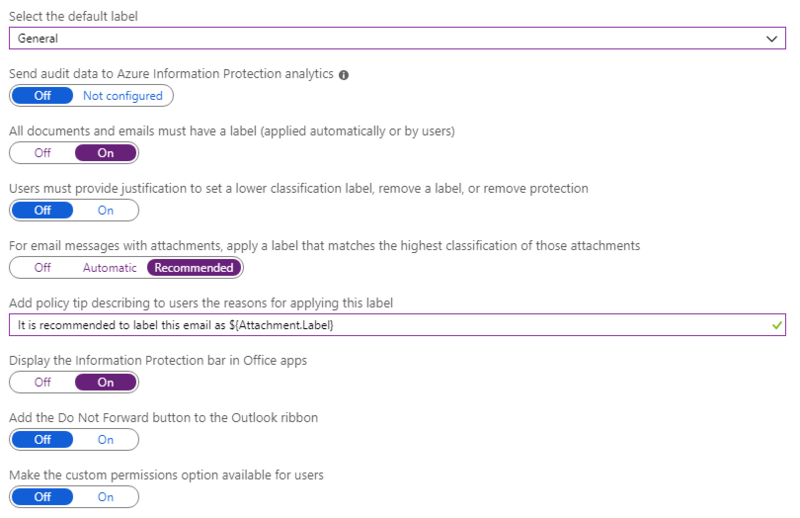 For email messages with attachments, apply a label that matches the highest classification of those attachments Recommended This setting prompts users to select a higher classification label for their emails when they attach documents that have a higher classification than your selected default label. 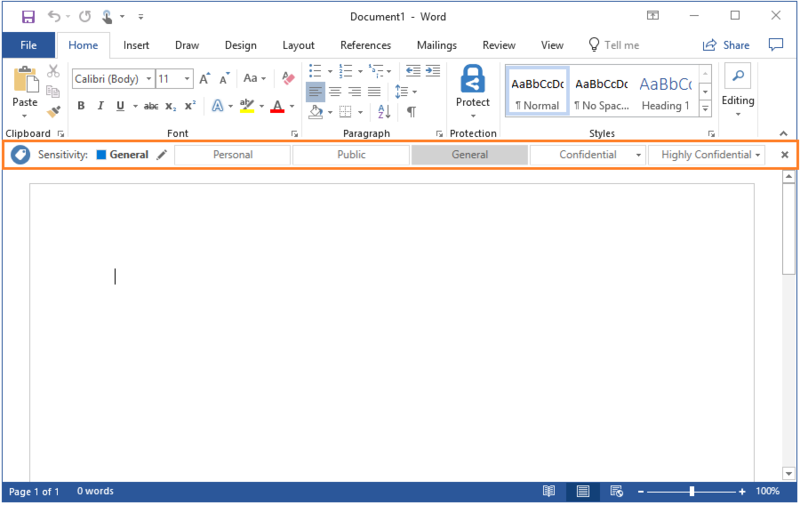 Display the Information Protection bar in Office apps On Displaying the Information Protection bar makes it easier for users to see and change the default label. Select Save on this Policy: Global blade, and if you're prompted to confirm your action, select OK.
For this tutorial, we'll use Word and Outlook to see your policy changes in action. If these apps were already loaded before you changed the policy settings, restart them to download the changes. Open a new document in Word. You see the document is automatically labeled as General rather than relying on users to select a label. Now, from the pull-down menu, you see that the General label is selected because it has a check mark next to it. To change the currently selected label, users can select a different label from the list. When users are new to labeling, they probably won't remember to select the Protect button each time. They also might not realize that they can select another label. To display the Information Protection bar again, select Show Bar from the pull-down menu. You can select a different default label for Outlook, by configuring an advanced client setting. You can change the currently selected General label to a different label, but you cannot remove it. Because we changed the All documents and emails must have a label setting to On, the Delete Label icon is not available on the Information Protection bar. Together with a default label, mandatory labeling ensures that new and edited documents (and emails) have a base classification of your choosing. If we hadn't set a default label with the mandatory labeling setting, users are always prompted to select a label when they save an unlabeled document or send an unlabeled email. For many users, these continual prompts can be frustrating and also result in less accurate labeling. For them to be prompted to select a label when they've finished working on a document or email interrupts their workflows, and there's then a temptation for them to select any label at random so they can move onto the next thing they need to do. For the open Word document, choose a label that has a higher classification than General. For example, one of the sublabels under Confidential, such as Confidential - Anyone (not protected). Save the document locally and give it any name. 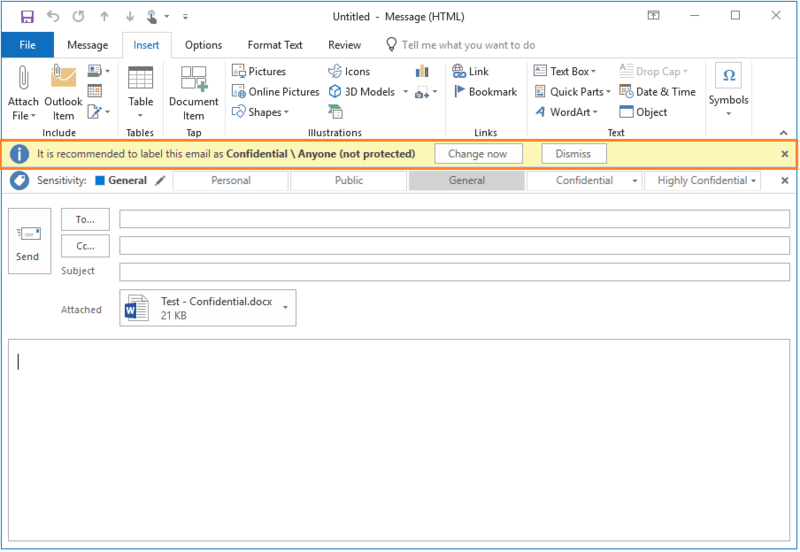 Start Outlook and create a new email message. Just as we saw with Word, the new email message is automatically labeled as General and the Information Protection bar is displayed. If you click Dismiss, the new label is not applied but you see how the email is still labeled with the default label that we configured, General. The available labels are still visible to select as an alternative. The Information Protection bar then displays again, for users to select an alternative label. Because the label is selected before sending the email, there's no need to actually send the email to see how this policy setting works. You can close the email without sending or saving it. However, you might want to try repeating this exercise but also attach another document that has a higher classification (a sublabel from the Highly Confidential label). Then, you'll see how the prompt changes to apply the higher classification label. If you test multiple attachments with sublabels that have same parent label, you must configure an advanced client setting to support their ordering in the Azure portal. Restart your Word and Outlook apps to download these changes. 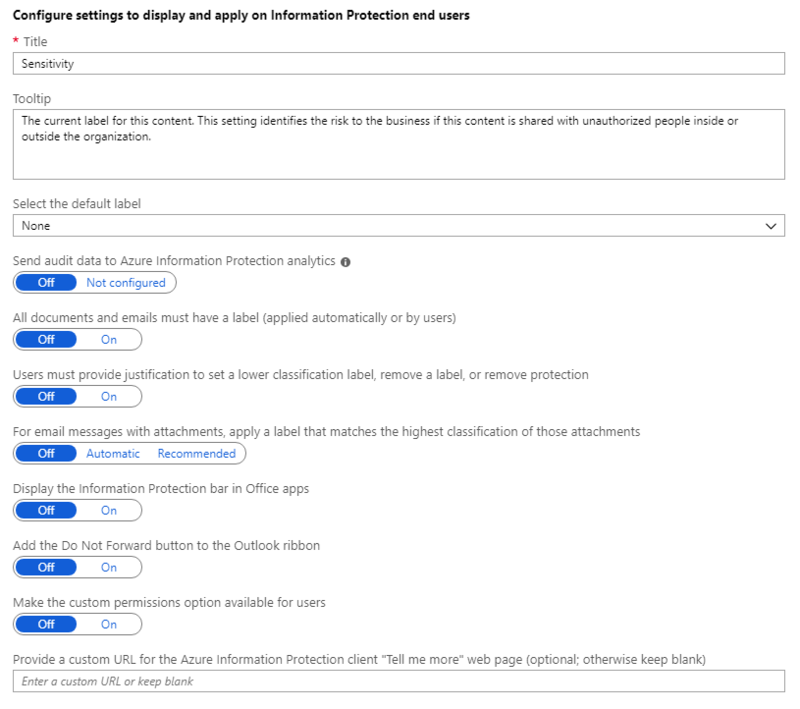 For more information about editing the Azure Information Protection policy settings, see How to configure the policy settings for Azure Information Protection. The policy settings that we changed helped to ensure a base level of classification, as well as encourage users to select an appropriate label. The next step is to augment this strategy by inspecting the contents of documents and emails, and then recommending or automatically applying an appropriate label. You do this by configuring labels for conditions. To learn more, see How to configure conditions for automatic and recommended classification for Azure Information Protection.